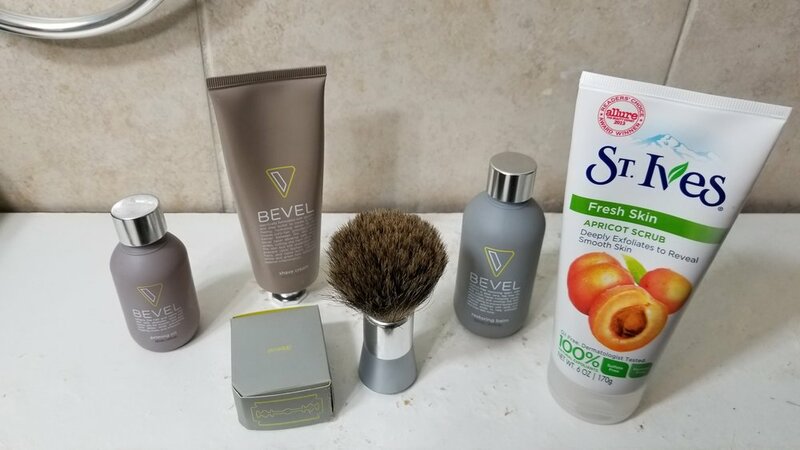 So does Bevel help prevent razor bumps? That was a bold claim to make but after using it for three months I can say...............yes. Yes it does. However, I do believe that is the case based on two things: 1) The average man shaves improperly and Bevel shows you how to do it right 2) The ingredients used in their products. In the interest of not wasting your time, I summarized how to properly shave in my last grooming post. The pic below is from the Bevel website and it actually comes in a booklet form with the products (I misplaced mine). As I mentioned in a previous, who knew there was an actual process to shaving that involved more than shaving cream and after shave, let's break them down. 1)The Priming Oil - I have sensitive skin. I can't just go to town on my skin, I have to prep for it. This oil helps soften the hair and skin before the shave. Two main ingredients of this priming oil are caster oil and olive oil. Caster oil naturally hydrates skin while unclogging the pores. Olive oil has many other benefits to the skin but for razor bumps specifically, it fights the bacteria that cause razor bumps. This is important because when you wash your face with hot warm it opens up your pores and bacteria may go in. 2) The Shave Cream - applying the cream in a circular motion with the shave brush, this cream sets the razor up to run smoothly on your skin. With Aloe Vera and vitamin E, your skin will moisturizing and protection it needs when the blade comes in contact with it. 3) Safety Razor - I spoke about my love for a safety razor in my previous post. At the end of the day, whether it's a safety razor or five blade razor, a blade is touching your skin so you want to have as little irritation as possible. Of course the more blades on your skin the more likely the skin will be irritated therefore I recommend using a safety razor. 4) Exfoliating Cream - This is an product that is NOT part of the bevel shave system, this is my addition to the process based on experience. Anytime I use exfoliating cream my skin feels ridiculously smooth so I figured why not use it after I shave to have a smooth face/neck. And it works!!!!! So after I wash the remaining shaving cream with hot water, I exfoliate using the exfoliating cream that feels a little rough and looks like brown rice. Rub it in a circle motion for 10-15 seconds then wash it off with cold water to close your pores. 5) Restoring Balm - I've put on some after shave and it stings! This is quite the opposite. It delivers a cool sensation and sweet aroma. The ingredient Witch Hazel stops the itch from your irritated skin, removes excess oil and stops any bleeding from nics (which can happen if you're not used to a safety razor). Another ingredient used in this is Tea Tree Oil which also stops bleeding from nics and relieves razor burns. This is probably my favorite out of the bunch, you just have to feel the cooling sensation it gives you. I use it on days I don't shave. All in all, I give Bevel a thumbs up. They made a big claim and so far has backed it up in my experience. I have to also give creditto the exfoliating cream, that does help as well. Two ways to purchase this: 1) Buy the 30 day kit for $89.95 or 2) get a subscription where they charge $34 up front and $29 for the next two months. Won't complain about the price because it does deliver the results I was looking for. I say it's well worth looking into, if you can give Bevel a shot.